Next Up: *We are excited to kick-off the 2019 year and season of The Lunch Circuit with our TWENTIETH EDITION of The Lunch Circuit on Wednesday, February 13th at 11:30am-1pm. This time, we are honored to feature Cherokee County entrepreneur from the Canton/Ball Ground area, John Mercure, Founder/CEO/Visionary of Raydeo Enterprises: a custom design, development, manufacturer and installer of millwork fabrications from metal and wood to signs, railings, and awnings. John’s creative spirit, innovative thinking, success in entrepreneurship and unique stories make him a great fit for our next Lunch Circuit featured entrepreneur. John is the Owner, Founder and Visionary Leader. Since Raydeo’s establishment in 1987, John has ensured a promise of satisfaction for every project that has come out of their doors. Having been in the business for thirty years, he knows how to take even the most obscure of concepts and turn them into reality. A few memorable projects include World Trade Center, Coffee Stations, Grand Central Station, Ponce City Market, Mercedes Benz Stadium and the new Atlanta Braves Battery Park to name a few. 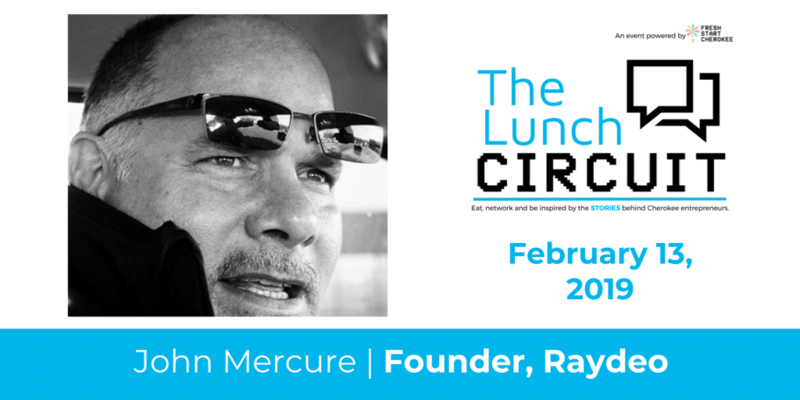 The Lunch Circuit is a monthly exclusive lunch gathering of both aspiring and current entrepreneurs to eat, build community and learn the stories behind successful Cherokee entrepreneurs. An event powered by Fresh Start Cherokee, hosted by Cherokee Office of Economic Development and located at The Circuit Woodstock.